In this tutorial, we will show how to use HINT-ATAC to compare changes in activity of transcription factors with differential footprinting. We will use for this data presented at HINT-ATAC paper, where we contrast footprints of two dendritic cells. In short, we cultured classical DC type1 (cDC1) and plasmacytoid DC (pDC) from mouse bone marrow and performed Omni ATAC-seq experiment (original data is deposited in GEO). 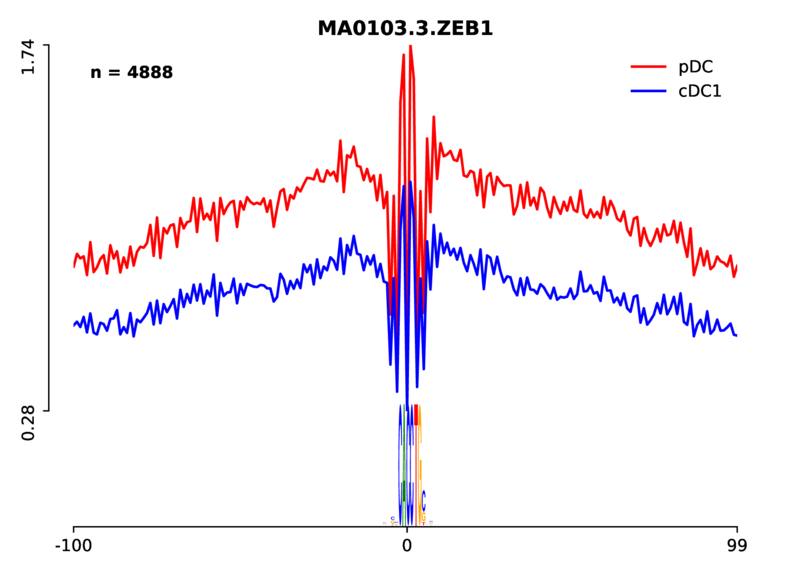 We have performed low-level analysis steps including reads alignment with Bowtie2 and peaks calling with MACS2. HINT requires an bam file (indexed and sorted) and peaks as input. HINT only consider peak regions for footprinting to speed up the analysis. Each command will generate an output file in the current folder, containing the genomic locations of the footprints. HINT-ATAC (pDC.bed and cDC1.bed for the example above). It also produces a file with ending “.info”, which has statistics from the libraries, i.e. the total number of reads and so on. 3. HINT also outputs signals for visualization in a genome browser. For this, you can use a special HINT command to generate genomic profiles (BigWig files). This bigwig file contains the number of ATAC-seq reads at each genomic position as estimated by HINT-ATAC after signal normalization and cleavage bias correction. Note that this command currently only supports bias correction and shifts of ATAC-seq. This is more accurate than simply looking a coverage profiles of a bam file. Open all bigwig and footprint files (bed) generated above in a genome browser, e.g. IGV. Remember these experiments are based on mouse genome mm9 . Check for example the genomic profiles around the gene Zbtb46 in the below, which is expressed by cDC but not by pDC. We observe that this gene has several open chromatin regions for these two cell types, but one particular region has cDC1 specific footprints. 4. One of the main applications of footprinting is to find TFs associated with a particular cellular condition. We can do this by first finding motifs overlapping with predicted footprints. RGT suite also offers a tool for finding motif predicted binding sites (MPBS) with JASPAR, UNIPROBE or HOCOMOCO motifs. where pDC.bed and cDC1.bed are the footprint predictions obtained in step 2. Depending on the number of footprints and size of motif database, the previous command requires long computation time. The above commands will make a folder named match and generate a BED file for each input file, containing the matched motif instances for each footprint region. The 4th column contains the motif name and the 5th column the bit-score of the motif match. Check here for more details about motif matching. The above command will read the motif matching files generated by step 4 and BAM files which contain the sequencing reads to perform the comparison. Note that here we specify –bc to use the bias-corrected signal (currently only ATAC-seq is supported). The command –nc allow parallel execution of the job. After the command is done, a new folder ‘cDC1_pDC’ will be created. Inside it, a scatter plot can be found, which shows the transcription factor (TF) activity dynamics between cDC1 and pDC as shown below. The y-axis represents the differences in TF activity and names of TFs with significant differential activity values are colored as red (x-axis is a random number for jittering purposes). Each point represents a factor, but we only label TFs with a significant change in activity score (p-value < 0.05). These statistics can be obtained from file cDC1_pDC_statistics.txt. 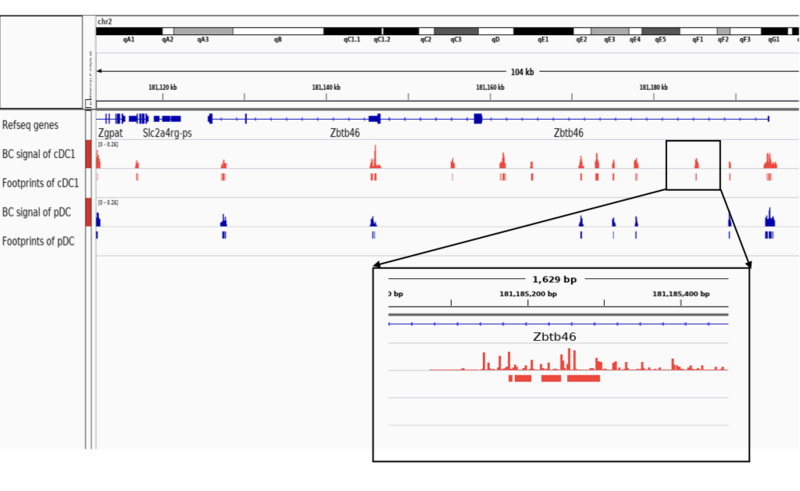 From the above plot, we can see that motif BATF::JUN and Zeb1 show significant differences, suggesting that they are related to cDC1 and pDC, respectively. 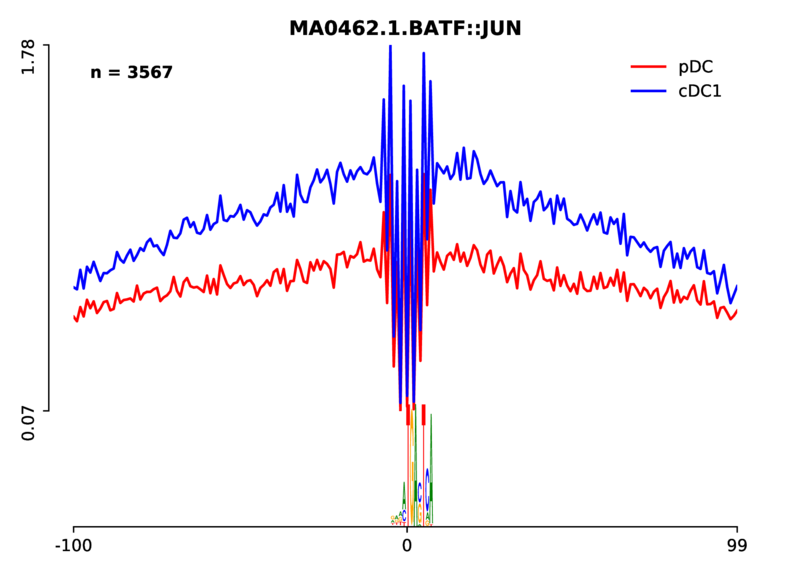 In addition, a folder called lineplot can be found, which contains the ATAC-seq profile for each of the motifs found in the mpbs bed files. Let’s check the profiles of these two factors, you will see that BATF has the higher number of ATAC-seq counts in cDC1 cells, while Zeb1 has more ATAC-seq in pDC cells. 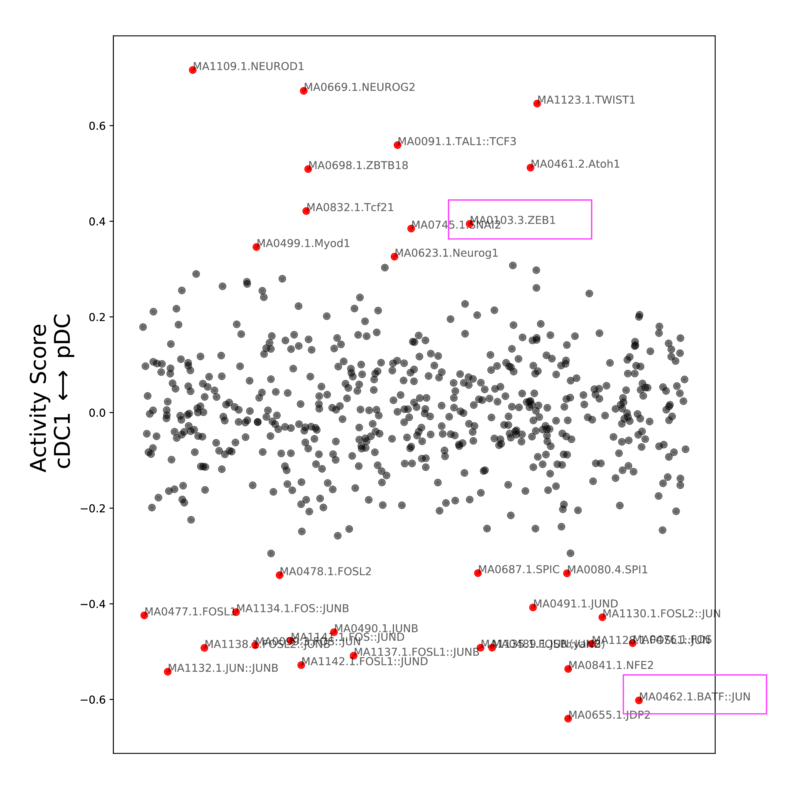 Higher ATAC-seq signal indicates the higher activity of the factor in that particular cell. Other known DC factors identified by HINT-ATAC include Spi1 (also referred as PU.1 or SFPI1), which is a master regulator of DC differentiation and mostly active in cDC.